A concept design for a new school on Concord Street, in South Norwalk. NORWALK, Conn. – Board of Education officials are considering whether a brand new school would be more cost-effective and desirable than renovating the building that currently houses Columbus Magnet School. A new school on Concord Street would cost about $3 million more than renovating the 81-year-old Columbus Magnet School and the layout would be safer for children, officials said Monday. The life expectancy of a new school would be at least 30 years, while a renovated school could be expected to last 20 years, Jim Giuliano of Construction Solutions Group said. In addition, maintenance and energy costs would be lower for a new school. Renovating would cost Norwalk $23.1 million, while building a new school would cost the City $26.2 million. The total cost of each project is higher; the costs to Norwalk assume $8.7 million in state reimbursement for the renovation project and $6.6 million in reimbursement for a new building. The plan to update the Concord Street school, in accordance with an International Baccalaureate curriculum for elementary school students, is part of the second prong of Norwalk Public Schools’ plan to create 900 new seats for Norwalk school children and address decades of neglect of school infrastructure. A new school would be built on the Nathaniel Ely site and the Columbus school population would move into it. 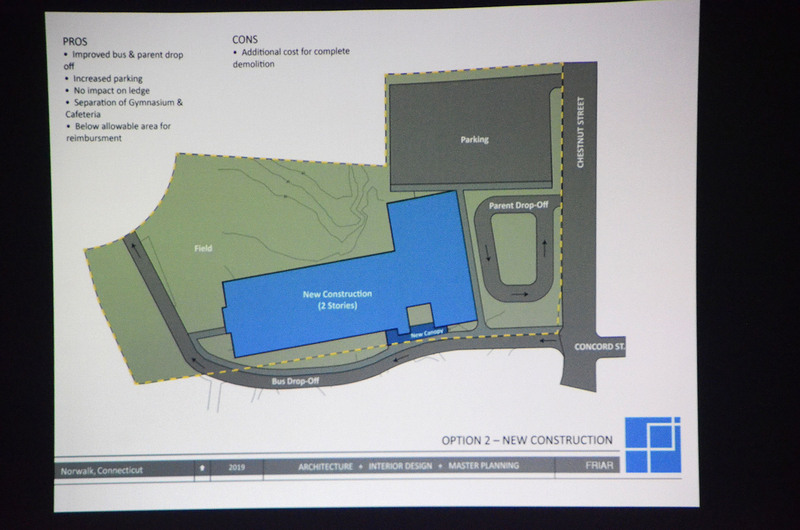 Then the existing school would be renovated-as-new, according to the plan. The plan to empty the school makes for an opportunity, Giuliano, the City’s project manager, said Monday to the Board of Education Facilities Committee. Architects didn’t imagine the costs would be so close when they started considering demolishing the building, he said. The state has strict regulations for square footage based on the number of students, and since Columbus was built in 1938 it has extra space, including “undesirable” space in the basement, Giuliano said. The state will reimburse a percentage of costs on up to 54,800 square feet of renovation, and the Columbus renovation project would be 63,500 square feet because an addition is needed to separate the cafeteria from the gymnasium and there will be 150 more students in the school, he explained. A concept for a new school features 53,500 square feet and would put all the kindergarten, first grade and second grade students on the ground level, while the renovation would put the second graders on the second floor, Bob Roach and Adam Palmer of Friar Architecture explained. The music classrooms would be separated from the academic areas, meaning the noise would not interfere with learning, and the cafeteria and gymnasiums would be separate yet adjacent, a better arrangement for events, they said. In addition, the bus loop would be off the street and the parents-only parking lot would be larger. Those also factor in different reimbursement rates for new versus renovated. Giuliano hedged a bit, saying he would have to come back to Facilities Committee Chairman Mike Barbis with an updated analysis involving eligible costs reduced by overages in square footage. Norwalk Superintendent of Schools Steven Adamowski said he hadn’t yet discussed Columbus with Mayor Harry Rilling. The concept for a renovated Concord Street school. Please keep the historic brick school, and do not shoehorn a suburban solution into this urban setting! That would be an urban planning mistake, and it would destroy the streetscape of historic buildings that give this neighborhood a unique historic character that tells a rich story of Norwalk’s past. Erasing our history is not what SoNo is all about! Most importantly, in a recent seminar I attended on Adaptive Reuse on March 1st at the Wall Street Theater, experts from across the country including the National Trust for Historic Preservation offered strong evidence based on science that renovating historic buildings is the greener solution, and have much less carbon cost in the end as demolition and new construction create huge energy costs that more than offset the energy savings of new buildings. I hope this option for a suburban-style and car-oriented school is not going to move very far as a viable solution. For the record, I fully support the BoE plan to build the new school and renovate this one. But demolishing the historic and beautiful and solidly-built Columbus School must not be a serious option! There is a reason that Columbus has lasted 81 years. It was well-built to begin with. It can last far longer than another 20 years with proper and timely maintenance. A new school building with a life expectancy of 30 years is a waste of time and money. A well done refurbishment of the current building should include a new wing for a gym closer to the current field, rooms for Art and Music classes and a new cafeteria lacking since I was a student there in the 1960s. 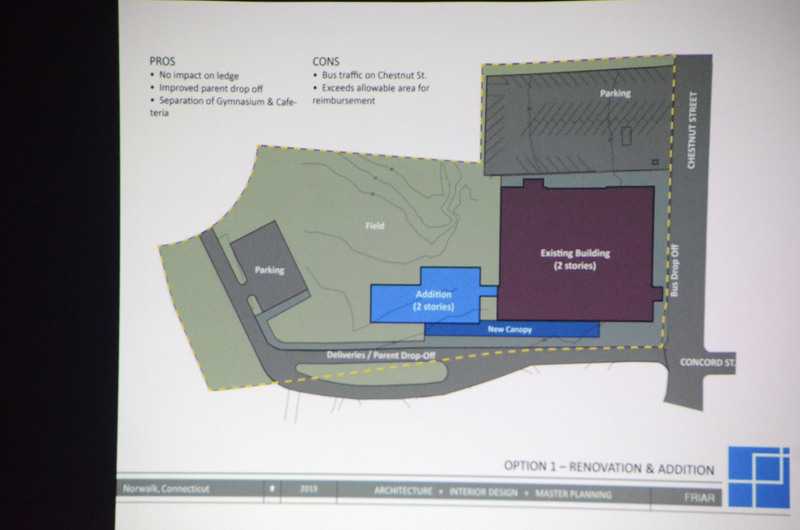 The comment regarding “undesirable” basement space alludes to the air raid shelter space and should be considered an asset as it could provide storage space for the district, if a separate entrance to it, outside of the building could be provided, as not to interfere with classes.